Thank you for this beautiful tribute to a wonderful person. Can you provide contact information so that we can send her some healing vibes? Sandero on Thu, 01/28/2010 - 8:48am. she graciously took the time to tell me how the windows of her apartment imploded from the WTC debris cloud. She managed to survive by breathing through a wet towel. And it takes courage to be the first person (I think) to give Prof. Jones a WTC dust sample. She did it publicly from the start, too, and did not wish to remain anonymous. So we have a lot to thank Janette for. Thank you! Kevin O on Thu, 01/28/2010 - 1:42pm. Thanks Carol for the update! All things said and done at least you Janette can have the peace of mind that you have set a great example to us all and to your kin! John Bursill on Thu, 01/28/2010 - 7:21pm.
! ...I almost missed this because it was not front page! Thank you so much for sharing this story!! It is told from a personal, caring and very real perspective! Also, I appreciate the paragraph about the first-hand experience with the Chinese herbal treatment. TomT on Fri, 01/29/2010 - 6:19am. to make sure she is ok with it being on the front page and she is. For those who don't know her, Janette is an incredible artist and always throws great parties. She has also done some excellent and much needed fundraising for the Northern California 9/11 Truth Alliance over the years. Please keep sending positive vibes her way (she lives in the hills of Oakland, CA). LeftWright on Fri, 01/29/2010 - 8:15pm. TomT on Fri, 01/29/2010 - 9:37pm. Janette is one of the finest people I have ever met. All love and healing and light and bliss surround you Janette. There truly would be peace in the world if everyone were more like you. John_Parulis on Fri, 01/29/2010 - 8:37pm. Janette has had a profound influence on me. I was awake to 911 truth for only six months when I met her in Arizona at the 911 Accountability conference. She was among the most profound and sober voices there. 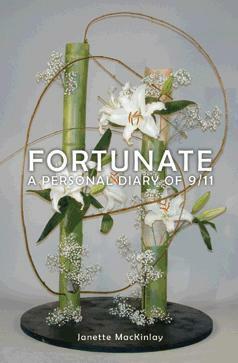 Her book, "Fortunate," (which I bought) says it all. The beauty of her floral creations commemorating Sept 11 exemplifies her vision of the truth -- the beauty of LIVING in truth. She challenged all of us that weekend to move away from the horrific images of burning buildings, of death and destruction and instead seek to express love and compassion. Simple, but I vividly remember her reminder to all of us that weekend always put a slash between 9 and 11 so not to confuse our cause with the "emergency" moniker: "nine, one, one." She is very much a part of the music, and the art, and the words I choose when expressing myself about our cause. We all have a lot to learn from her. She has already once risen above the depths of destruction with an unscathed soul. If anyone can beat the odds of her condition, it's Janette. I wish her a speedy recovery and many, many more years of happiness. 911Peacenik on Fri, 01/29/2010 - 9:06pm. I'm so sorry to hear this. There were so many victims that day and since. Yet, no independent inquiry to date. In a way, we were all victims of 9/11, and we can toss in the dead Iraqi's and Afghanis. Meria on Sat, 01/30/2010 - 9:12pm. I have saved the photo of Janette's beautiful ikebana as part of my screen saver images, and will be reminded to send her healing energy each time I see it. whit on Sun, 01/31/2010 - 2:29pm. Could you post this note to comment on 9/11 blogger for me? and was more in learning about more the subject. LeftWright on Sun, 01/31/2010 - 4:40pm. Joe on Sun, 01/31/2010 - 9:13pm. Janette MacKinlay's web site . . .
JTL on Sun, 01/31/2010 - 6:59pm.